Mia’s expression says it all! Mia’s father, Raul de Molina. Have you ever been on the beach at night, looking up at the stars, and wondered what’s out there? Come explore our universe! You too can enjoy the stars any time, any place. Classes start again in fall! These classes are geared towards the novice interested in appreciating the universe and finding their way around the night sky. 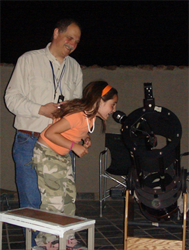 We start with simple star charts, then move up to choosing and using telescopes. To further your enjoyment of what you're looking at, we cover basic astronomy topics such as stars, planets, deep space and cosmology. Basic star charts are included, and the final class is a field trip to a darker sky location, weather permitting.